John James has sent this wedding photo (his wife Lesley's Mums aunts wedding). Their reception was held in Boston Manor House and I think their marriage may have been at St John's Roman Catholic Church as both Lesley's mum's grandparents were Roman Catholic. 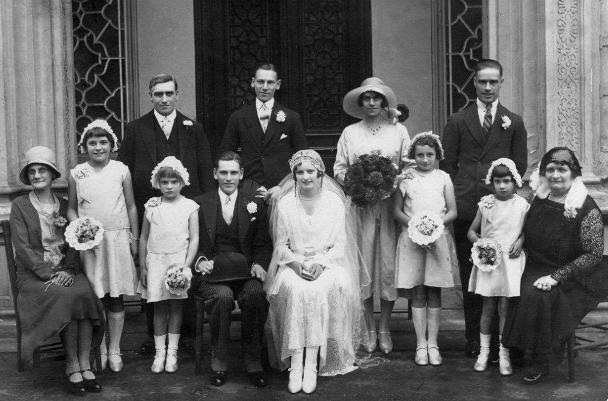 The bridegroom is Geoffrey Len GOODRIDGE, his bride is Margaret Louise KEYES (known as Lulu). The elderly lady to her left in black sitting down with the white fur around her neck is her mother Margaret KEYES nee CAMERON. I think she is in black as her husband John Daniel Joseph KEYES died in 1931. He is the one who family legend has it invented Jeyes fluid, he was a chemist. Next to the elderly lady in black is Lesley's mum who was a bridesmaid, the next bridesmaid is I think Pamela RAINES, Lesley's Mum's cousin. Behind her the two adults to the left of the bride are Lesley's mum's mum (the one wearing the hat carrying a bouquet) Laura KEYES nee BECKINGHAM and John Joseph Victor KEYES.